Part 1: What do these standards say? Part 2: How do Operations & Algebraic Thinking relate to other parts of Grade 1? Part 3: Where do Operations & Algebraic Thinking come from, and where are they going? Beyond K-2: What’s next with addition and subtraction? 1. What is a Content Guide? 2. What’s in a Content Guide? 3. How can I use the Content Guides? 4. Why the Content Guides? 5. What is the relationship between the Content Guides and the Progressions? 6. How were the resources selected? 7. Why are the Content Guides only about a few standards? Where are the rest of the standards? 8. How do I stay informed about new Content Guides? What's in a Content Guide and how do I use it? 1.OA.A | Represent and solve problems involving addition and subtraction. 1.OA.B | Understand and apply properties of operations and the relationship between addition and subtraction. 1.OA.C | Add and subtract within 20. 1.OA.D | Work with addition and subtraction equations. 1.MD.C | Represent and interpret data. Welcome to the UnboundEd Mathematics Guide series! These guides are designed to explain what new, high standards for mathematics say about what students should learn in each grade, and what they mean for curriculum and instruction. This guide, the first for Grade 1, includes three parts. The first part gives a “tour” of the standards for Operations & Algebraic Thinking (1.OA) using freely available online resources that you can use or adapt for your class. The second part shows how Operations & Algebraic Thinking relate to representing and interpreting data in Grade 1 (1.MD.C). And the third part explains where the skills and understandings within 1.OA are situated in the progression of learning in Grades K-2. Throughout all of our guides, we include a large number of sample math problems. We strongly suggest tackling these problems yourself to help best understand the methods and strategies we’re covering, and the potential challenges your students might face. Much of students’ early learning in mathematics revolves around the operations of addition, subtraction, multiplication, and division. But as we know from experience, being able to calculate an answer isn’t enough; students need to have a complete understanding of each of these operations in order to become flexible problem solvers and achieve success in later grades. The standards in the Operations & Algebraic Thinking (OA) domain, which runs from Kindergarten through Grade 5, are designed to meet this need. The OA standards specify the meanings and properties of each operation, the fluencies that students should achieve at each grade level, and the types of problems they should be able to solve. In Grade 1, where the emphasis is on addition and subtraction, the standards focus on understanding the properties of those operations, adding and subtracting within 20 using increasingly advanced methods, and solving word problems in a variety of contexts. Why begin the year with addition and subtraction? The short answer is that there’s a lot to learn, so students need to start early. All of the OA standards in Grade 1 are considered major work, meaning they deserve a significant amount of instructional time over the course of the school year.1 The Common Core State Standards for Mathematics (CCSSM) are organized into major, additional, and supporting clusters in the Focus by Grade Level documents from Student Achievement Partners. The K-8 Publishers’ Criteria for the Common Core Standards for Mathematics recommends spending 65-85% of instructional time on the major work of the grade. In this guide, these clusters are indicated by a <greensquare>. The Common Core State Standards for Mathematics (CCSSM) are organized into major, additional, and supporting clusters in the Focus by Grade Level documents from Student Achievement Partners. The K-8 Publishers’ Criteria for the Common Core Standards for Mathematics recommends spending 65-85% of instructional time on the major work of the grade. In this guide, these clusters are indicated by a <greensquare>. The Common Core State Standards for Mathematics (CCSSM) are organized into major, additional, and supporting clusters in the Focus by Grade Level documents from Student Achievement Partners. The K-8 Publishers’ Criteria for the Common Core Standards for Mathematics recommends spending 65-85% of instructional time on the major work of the grade. In this guide, these clusters are indicated by a <greensquare>. Starting with these standards means you’ll be able to dedicate the right amount of time and attention to them over the long term. (Building fluency, for example, involves understanding the properties of addition and subtraction and requires lots of practice.) Moreover, other major work of Grade 1, such as work with place value in the Number & Operations in Base Ten (NBT) domain, may be easier to understand once students have a firm basis in addition and subtraction. The OA standards in Grade 1 are grouped into four clusters (A, B, C, and D). We’ll start by examining the third of these (1.OA.C), which lays out the fluency expectations for the end of Grade 1. Perhaps more important, it articulates all of the strategies that students should use to develop fluency with addition and subtraction. In this discussion, we’ll look closely at computation methods. From there, we’ll look at the second cluster (1.OA.B), which deals with the properties of addition and subtraction, the relationship between the two operations, and how students can use these as strategies for finding sums and differences. Once these strategies are understood, we’ll return to the first cluster (1.OA.A) to see how word problems necessitate the use of these new strategies and how students can put these strategies to work. Lastly, we’ll see what students should understand about equations, and how they can use equations in solving problems (1.OA.D). Throughout this guide, we’ll refer frequently to the Kindergarten standards to see how the learning in Grade 1 builds on the foundations of the previous year. It’s important to note that the clusters, and the standards within the clusters, are not necessarily sequenced in the order in which they have to be taught. (Standards are only a set of expectations of what students should know and be able to do by the end of each year; they don’t prescribe an exact sequence or curriculum.) So planning your instruction sequence carefully can ensure your students continue to build on previous understandings. As we go, think about the connections you see between standards, and how you can use these connections to help students build on their previous understandings. Throughout the guide, we’ll look at examples of tasks and lessons that focus on students’ abilities to make sense of problems and persevere in solving them (MP.1). As students are exposed to varied contexts and problem types, they will need to think carefully to understand each problem and develop an appropriate solution method. Let’s begin by looking at the standards in cluster 1.OA.C. Then we’ll think about what they mean and how they look in practice. From these standards, we can see that students are expected to add and subtract within 20 and to fluently add and subtract within 10 by the end of Grade 1. We can also see that students should use strategies such as “counting on,” “making ten,” “decomposing a number leading to a ten,” and “creating equivalent but easier or known sums” as a means of achieving these goals. These strategies are part of a hierarchy of computation methods for single-digit addition and subtraction. These methods can be thought of in terms of levels. It’s important to understand these levels, and the appropriate prerequisites, so that you can support students with using increasingly advanced methods. In Kindergarten, students primarily work with the Level 1 method; our goal in Grade 1 is to move students along from a fundamental understanding of “counting all” to the more efficient and widely applicable strategies of Levels 2 and 3. Let’s take a close look at these methods and how they’re tied to the standards. The first of these methods is considered the Level 1 method: “direct modeling by counting all or taking away.” Just as the name implies, this means students add and subtract by counting directly, using pictures or manipulatives to model quantities. This is a focus of work in Kindergarten. (K.OA.A.2) In the case of addition, students model putting together each addend (a number that is added to another number) and then count the total. In the case of subtraction, students model the total, then take away an addend, and then count the remaining objects to determine the unknown addend. The word problems below reflect simple addition and subtraction scenarios. The diagram below illustrates count-all and take-away (and count-remaining) strategies.3 Progressions for the Common Core State Standards in Mathematics (draft): K, Counting and Cardinality; K–5, Operations and Algebraic Thinking, p. 36. Progressions for the Common Core State Standards in Mathematics (draft): K, Counting and Cardinality; K–5, Operations and Algebraic Thinking, p. 36. Progressions for the Common Core State Standards in Mathematics (draft): K, Counting and Cardinality; K–5, Operations and Algebraic Thinking, p. 36. Addition: Eight children were in the classroom. Six more children entered the classroom. How many children are in the classroom now? Subtraction: There were 14 children in the classroom. Eight of the children left the classroom. How many students are in the classroom now? Students begin adding and subtracting with Level 1 computation methods, using contexts in which the result is the unknown (i.e., the total in addition or the remaining in subtraction). These simpler contexts allow students to easily add quantities or take away quantities and count to find the unknown. As addition and subtraction problems become more complex, more sophisticated methods of computation will become useful and efficient for students.4 The addition and subtraction word problems that elementary students should master are described in Table 1 of the glossary of the CCSSM. There is a hierarchy of complexity with these problems that is described on page 9 in the Progressions. All of this is explained in great detail on the discussion of cluster 1.OA.A below. The addition and subtraction word problems that elementary students should master are described in Table 1 of the glossary of the CCSSM. There is a hierarchy of complexity with these problems that is described on page 9 in the Progressions. All of this is explained in great detail on the discussion of cluster 1.OA.A below. The addition and subtraction word problems that elementary students should master are described in Table 1 of the glossary of the CCSSM. There is a hierarchy of complexity with these problems that is described on page 9 in the Progressions. All of this is explained in great detail on the discussion of cluster 1.OA.A below. The Level 2 method is “counting on” and is part of the standards in Grade 1. In fact, standard 1.OA.C.5 is the bridge between the Level 1 and Level 2 methods; it rests on some key prerequisites from Kindergarten. The counting on method is rooted in being able to count forward from a given number (K.CC.A.2 )and on understanding that each successive number name refers to a quantity that is one larger.K.CC.4c In counting on, students understand that the total is composed of addends, and counting on from one addend by the other addend is actually addition and can be used to find the total. Additionally, counting on from a known addend to a given total can be used to determine an unknown addend; it’s also a more efficient method for addition and subtraction than counting all. The examples below could be solved with counting all or counting on; however, counting on is more efficient and should be a focus of our work in Grade 1. The diagram below illustrates count-on strategies for each problem.5 Progressions for the Common Core State Standards in Mathematics (draft): K, Counting and Cardinality; K–5, Operations and Algebraic Thinking, p. 36. Progressions for the Common Core State Standards in Mathematics (draft): K, Counting and Cardinality; K–5, Operations and Algebraic Thinking, p. 36. Progressions for the Common Core State Standards in Mathematics (draft): K, Counting and Cardinality; K–5, Operations and Algebraic Thinking, p. 36. Addition: Kate and Nana baked cookies. They made 8 heart cookies and 6 square cookies. How many cookies did they make in total? Subtraction: Kate and Nana baked cookies. They made 14 cookies in all. They gave away 8 cookies. How many cookies do they have left? Kate and Nana were baking cookies. They made 2 heart cookies and then made some square cookies. They made 8 cookies altogether. How many square cookies did they make? Draw and count on to show the story. Write a number sentence and a number bond to match the story. Grade 1, Module 1, Lesson 11 Available from engageny.org/resource/grade-1-mathematics-module-1-topic-c-lesson-11; accessed 2015-05-29. Copyright © 2015 Great Minds. UnboundEd is not affiliated with the copyright holder of this work. Can you see how difficult it would be to solve this problem if we could only draw addends and count a total? We could draw 2, but how many would we draw next? Similarly, the context does not suggest subtraction (nothing is being taken away or taken apart), so drawing the total and crossing out parts is not obvious. It makes more sense to use the counting-on strategy to solve this problem. Students count on from 2, while drawing the square cookies (or counting on their fingers), until they get to 8. They can determine there are 6 square cookies by counting the number of square cookies drawn or by counting how many fingers they used to count on. The most sophisticated strategy for adding and subtracting single-digit numbers is the Level 3 method, “converting to an easier problem.” Students might use strategies such as making a 10, decomposing a number leading to a 10, or doubling plus or minus 1, or plus or minus 2. Level 3 methods depend on understanding the associative property of addition, (1.OA.B.3) which we will describe when we talk about cluster 1.OA.B. Also, the make-a-10 method for addition and subtraction has three important prerequisites:6 ibid. p. 16. ibid. p. 16. ibid. p. 16. Students can use Level 3 methods to solve easier addition and subtraction problems. 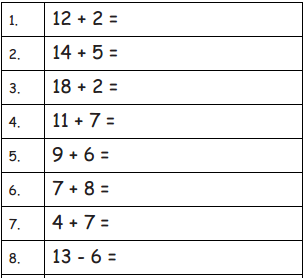 Referring back to the addition example in the counting all section (Eight children were in the classroom…), a student might make a 10 when adding 8 + 6 by decomposing the 6 into 2 + 4 and then making a 10 with the 8 and the 2 to get 10 + 4. Students might use manipulatives to demonstrate this initially, and then move to using number bonds to represent their thinking, and by Grade 2, this would be a mental strategy. (2.OA.B.2) The equation below shows the mathematics behind the strategy. A student might also use the doubles plus or minus 2 method: For 6 + 8, decompose the 8 into 6 + 2 and then add the easy double to get 12 + 2. The diagram below illustrates Level 3 methods with consideration of the easier addition and subtraction problems.7 ibid. p. 36. ibid. p. 36. ibid. p. 36. Students can also use Level 3 methods to solve more complex problems. In the task below, part a is an easier word problem, and parts b and c are more complex word problems. The solutions that follow show how a student could use the make a 10 strategy to solve the more complex problems. There were 7 children at the park. Then 4 more showed up. How many children were at the park all together? There were 7 children at the park. Some more showed up. Then there were 11 children in all. How many more children came? There were some children at the park. Four more children showed up. Then there were 11 children at the park. How many children were at the park to start with? “At the Park” by Illustrative Mathematics is licensed under CC BY 4.0. Then a student might make a 10 by thinking that 7 + 3 = 10 and one more is 11, so the number of children who came to the park is 4. Then a student might make a 10 by thinking that 6 + 4 = 10 and one more is 11, so there were 7 children at the park to start. So what does all of this mean for teaching students in Grade 1? Students will begin the year with different levels of readiness for the different computation levels. Ideally, in Kindergarten, students had a lot of experience solving addition and subtraction problems (within 10) using the Level 1 (count-all) method. 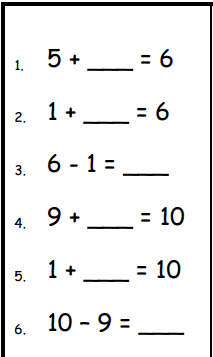 In fact, some students may have even moved on to the Level 2 (count-on) method for the easiest kinds of word problems. The goal in Grade 1 is for students to use Level 2 and Level 3 methods to extend addition and subtraction problem-solving beyond 10 (the Kindergarten expectation) to within 20.8 ibid. p. 12. ibid. p. 12. ibid. p. 12. However, some students may need more time before moving on to using Level 2 strategies. As you will see later, if students need more practice with counting-all strategies, it will be important to give them opportunities to solve problems best suited for counting all. From there, students move to Level 2 and Level 3 methods and toward more complex word problems. Finally, Level 3 methods are important for understanding the use of place value strategies for addition and subtraction within 100. (1.NBT.C.4) In this way, over time, we will bring students along from solving simple problems using “counting all” to solving more complex problems using more efficient strategies. The standards in cluster 1.OA.B. describe some of the prerequisite understandings that support students in using the Level 2 and 3 methods described above, as well as some additional strategies for adding and subtracting. Let’s begin by reading the standards in this cluster, and then we’ll think through what they mean and how they support students with the computation methods, and with addition and subtraction more generally. *Students need not use formal terms for these properties. Together, these two standards enable students to solve a wide array of problems in Grade 1; using properties and understanding subtraction as an unknown addend problem will help students to think flexibly about a variety of addition and subtraction situations. Let’s take a look at how students come to understand these tools. Six children were in the classroom. Eight more children entered the classroom. How many children are in the classroom now? A student might represent this addition situation as 6 + 8 = ___ and count on 8 from 6 to find the total. However, the problem can be made slightly simpler by counting on 6 from 8 to find the total; this is true for many problems at this level and beyond (consider 1 + 7, 2 + 12, etc.). Counting on from the larger addend, even when it is not in the “first” position, is rooted in the commutative property of addition. While students need not know the formal name for this property, it is important that they understand that commuting or “changing the order” is a property of addition. In the following lesson, the students learn that the order of adding the addends does not change the total. Invite students to sit on the carpet with their personal white boards, facing the front of the room. Choose 5 girls and 3 boys (or 3 girls and 5 boys) to stand in a row in front of the class. T: How many girls are standing here? T: How many boys are standing here? T: Write a number sentence on your board to show 5 girls plus 3 boys. T: Starting with the boys, write the number sentence on your boards. T: How many children do we have when we add 3 boys and 5 girls? T: Is that the same total or a different total of children as we had the last time we added the boys and girls? Grade 1, Module 1, Lesson 19 Available from engageny.org/resource/grade-1-mathematics-module-1-topic-e-lesson-19; accessed 2015-05-29. Copyright © 2015 Great Minds. UnboundEd is not affiliated with the copyright holder of this work. Later in the same lesson, students show that the position of the addends does not change the total. Also, note the position of the total on the right and the left side of the equal sign. This is an important student experience because having the total on the left helps students understand that the equal sign does not always mean “makes” or “results in” but always means “is the same as.”9 ibid. p. 9. ibid. p. 9. ibid. p. 9. 1. Write the number bond to match the picture. Then, complete the number sentences. Students should also understand the associative property of addition since it supports Level 3 methods such as make a 10. Let’s look closely at the example given in the standard: 2 + 6 + 4. As written, to find the total, a student would add first add 2 + 6, which is 8, and then add 4, to get 12. Formally, this is written as (2 + 6) + 4; the 2 + 6 is grouped together and added first. By the associative property, any grouping of addends will yield the same sum, so a student could make a ten by adding 6 + 4 first, which is 10, and then add 2, to also get 12. Formally, this is written as 2 + (6 + 4). Students will apply and often combine these properties of addition to support making an easier problem; for this reason they are sometimes referred to as a single property (“any order, any grouping”) at this grade level. For example, students may compute the same sum by first adding 2 and 4 to get 6, and then using doubles facts to determine a sum of 12. Formally, the original expression 2 + 6 + 4 is rewritten as (4 + 2) + 6 and both properties are applied. In the lesson below, the students use drawings to reason that the total is the same for three addends even when they are added in a different sequence. Students use both the commutative and associative properties of addition. Have students sit in a semicircle at the meeting area with their materials. T: (Write 5 + 3 + 5 = ___ on the board.) Draw to solve for this unknown. S: I added 5 + 3 and remembered that was 8. Then, I counted up 5 more from 8 and got 13. I drew the groups of 5 together and added those first since I knew they made ten. Then I added. 10 and 3 is 13. T: Talk with your partner. How were the strategies used by your classmates similar and different from one another? Which one was correct? S: (Discuss as the teacher circulates and listens.) They were both correct! Bob put the fives together and made ten, and Jo added them in order. T: So, even though they added two different numbers together first, did they get the same total? T: Wow! Okay. Let’s try this again. Let’s use Bob’s strategy of making ten from two of our addends. (Write 7 + 5 + 3 = ___.) Write the equation. Draw to show the three amounts. Grade 1, Module 2, Lesson 2 Available from engageny.org/resource/grade-1-mathematics-module-2-topic-lesson-2; accessed 2015-05-29. Copyright © 2015 Great Minds. UnboundEd is not affiliated with the copyright holder of this work. There are a couple of features to highlight in these examples about the commutative and associative properties. First, students never learn (and are not even exposed to) the formal language of commutative or associative. This is not required by the standards at this level and distracts from conceptual understanding of these properties. Second, the focus is always on applying these properties as strategies to add. (1.OA.B.3) Students don’t learn properties just for some intrinsic value; rather they are always framed as something helpful for solving problems. In addition to applying the properties of addition to solve addition and subtraction problems, students learn another useful tool for problem-solving: that a subtraction problem can be thought of as an unknown addend problem. (1.OA.B.4) This means, for example, understanding that 6 - 4 = ? can be interpreted as, 4 + ? = 6. The task below is designed to get students thinking this way; the teacher represents the situation as a subtraction problem and has the students count on to find the missing addend. One, two, three, four, five, six, seven, eight nine, ten. There are ten counters all together. This number should be small enough that the students have already found sums equal to that number, for example, 10. The teacher then hides some in the cup, calling it a cave. The students are shown how many counters are remaining outside of the cup, but not how many are in the cup. The number outside of the cup is called the part that they know. if the teacher is hiding 4 counters. The students need to find the missing number. By adding, or counting on to 6, the students determine that the teacher is hiding 4 counters. The equation is completed, and checked for accuracy by seeing how many counters are hidden under the cup. The students are then asked to help the teacher find another way to play the game with the same total number and a different part that they know. The goal is to find all the subtraction equations for the total they started with. When the teacher determines that the students understand the procedures of the game, they may play independently or in partners. “Cave Game Subtraction” by Illustrative Mathematics is licensed under CC BY 4.0. There were 14 children in the classroom. Some of the children left the classroom. Now there are 6 children left in the classroom. How many students left the classroom? Students might represent this as a subtraction situation (14 – ? = 6), but think of it as an unknown addend problem (e.g., 6 + ? = 14). Students could then use a Level 2 or 3 method to determine the unknown (for example, they could count on from 6). So far we have looked at the computation methods that students use to add single-digit numbers and the important understandings regarding the properties of addition and the relationship between addition and subtraction. Some of our examples have involved word problems. Let’s dig a little deeper: What are the characteristics of word problems in Grade 1? We can begin by reading the standards in cluster 1.OA.A. Extensive work with problem-solving is really important in Grades K-2. Using addition and subtraction to solve real-world problems helps students develop meaning for addition and subtraction, fosters growth with computation strategies, and helps them develop fluency with addition and subtraction facts. The types of word problems referred to in 1.OA.A.1 are further delineated into 12 subtypes in Table 1 of the standards.10 Glossary Table 1, from the Common Core Standards for Mathematics Glossary Table 1, from the Common Core Standards for Mathematics Glossary Table 1, from the Common Core Standards for Mathematics And the table below, adapted from the standards, highlights the specific subtypes that students should master at each grade level.11 Progressions for the Common Core State Standards in Mathematics (draft): K, Counting and Cardinality; K–5, Operations and Algebraic Thinking, p. 9. Progressions for the Common Core State Standards in Mathematics (draft): K, Counting and Cardinality; K–5, Operations and Algebraic Thinking, p. 9. Progressions for the Common Core State Standards in Mathematics (draft): K, Counting and Cardinality; K–5, Operations and Algebraic Thinking, p. 9. Though students are not expected to master all 12 of the subtypes in Grade 1, they should at least have experience with all of them. It will be helpful to spend some time digging into the different problem situations shown in the table, as we will refer to them extensively throughout the rest of this discussion. Lucy has six fewer apples than Julie. Lucy has eight apples. How many apples does Julie have? The key word in this problem, “fewer,” actually hints at the wrong operation; subtracting will not result in the correct answer. A better way to help students with problem-solving is to help them think situationally about the varied contexts. Using word problems to create meaning for operations helps students to better understand how to apply operations. Engaging with these same subtypes using numbers within 20, instead of within 10. Engaging with new, more complex subtypes. The new subtypes that are a focus for Grade 1 emphasize unknown changes and unknown addends as well as making comparisons. When students begin working with new types of addition and subtraction problems, the numbers are intentionally small so that students can make a drawing of all the objects needed to solve the problem.13 ibid. p. 13. ibid. p. 13. ibid. p. 13. Gradually, they come to use larger numbers while using equations and/or diagrams (drawings that do not require representing each object) to represent problems. Let’s now take a closer look at the ways that Grade 1 expands on work from Kindergarten. In the task below, students engage in each of the subtypes in the Take From row of the table. Part a is a familiar subtype from Kindergarten. Students may apply a Level 2 or 3 method to solve. Part b represents a transition to Grade 1 work because it is a Change Unknown problem (we want to know how many Char gave to her friend). Similarly, part c is a clear shift to Grade 1 because it is a Start Unknown problem (we want to know how many markers Char started with). Char had 10 markers. She gave 3 to a friend. How many did she have left? Char had 10 markers. She gave some to a friend. Now she has 7 left. How many markers did she give to her friend? Char had some markers. She gave 3 to a friend. Then she had 7 left. How many markers did she have to start with? “Sharing Markers” by Illustrative Mathematics is licensed under CC BY 4.0. Students might use the relationship between addition and subtraction and think of this subtraction problem as an unknown addend problem (e.g., ). Students could then use a Level 2 or 3 method to determine the unknown. A student might use the relationship between addition and subtraction and then count on to solve (e.g., ? = 3 + 7). In the tasks below, students engage in each of the subtypes in the Put Together/Take Apart row from the table. Part a is a familiar subtype from Kindergarten, now with bigger numbers. Students may apply a Level 2 or 3 method to solve. Parts b and c are Addend Unknown subtypes. 9 boys and 8 girls were in the class. How many children were in the class in all? 17 children were in the class. 9 were boys and the rest were girls. How many girls were in the class? 17 children were in the class. There were some boys and 8 girls. How many boys were in the class? “Boys and Girls, Variation 1” by Illustrative Mathematics is licensed under CC BY 4.0. For parts b and c, students might represent the problems using equations with the unknown addend in both positions and then use a Level 2 or Level 3 method to determine the unknown addend. 9 children were in the class. How many boys and how many girls could have been in the class? Solve the problem. Write an equation. Draw a picture and use it to explain your answer. “Boys and Girls, Variation 2” by Illustrative Mathematics is licensed under CC BY 4.0. There are 10 possible solutions for this task. An extension activity might involve finding all of the possible solutions. Or, students could be asked to find a classmate who used the same addends, but the addends mean different things. Compare problems are new to students in Grade 1. As we saw in the adapted table shown above, there are six variations of compare problems. Initially, students engage with problems that reflect both variations of the “Difference Unknown” subtype (i.e., How many more? How many fewer?). These variations build directly from Kindergarten, where students compared numbers (at first by comparing the number of objects in two different groups and then by comparing numbers directly). (K.CC.C.6, K.CC.C.7) The example below shows how nicely matching strategies used for comparing numbers in Kindergarten support compare problems in Grade 1. Matching diagrams progress into tape diagrams later in the year when students are more comfortable with writing numbers to represent quantities.14 ibid. p. 12. ibid. p. 12. ibid. p. 12. 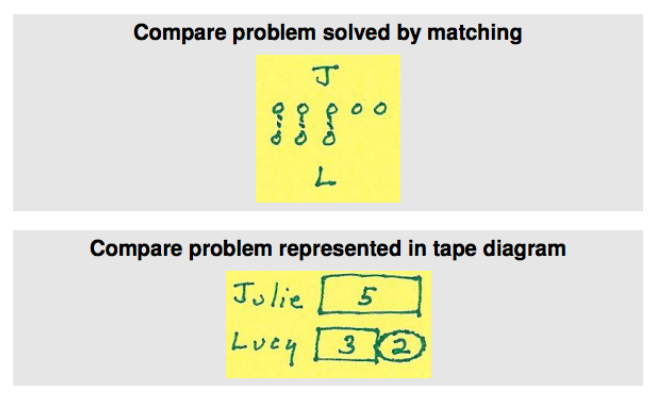 Tape diagrams are a very useful tool for representing compare problems. Once students feel comfortable understanding Difference Unknown problems, they should be ready for Bigger Unknown and Smaller Unknown problems. Two of the variations within these two subtypes can be particularly challenging for students in first grade, and though they should try problems with these more challenging variations, they aren’t expected to fully master them until Grade 2. Students should nonetheless be exposed to these problem types as vehicle for their understanding of Level 2 and 3 strategies. A challenge many students face with compare problems is understanding the meaning of the words in them. The task below provides an example of the six variations of compare problems. As you do the problems in the task, think about the linguistic demands for each of the variations and what challenges students might have in accessing these problems. Also, note that in the commentary included with the task, a mixed set of compare problems is not something students should experience until they have had extensive experience with each type of problem. You might consider using these questions in separate activities to start. a. Ali had 9 marbles. Maria had 5 marbles. How many more marbles did Ali have than Maria? Ali had 9 marbles. Maria had 5 marbles. How many fewer marbles did Maria have than Ali? b. Ali had 4 more marbles than Maria. Maria had 5 marbles. How many marbles did Ali have? Maria had 4 fewer marbles than Ali. Maria had 5 marbles. How many marbles did Ali have? c. Ali had 4 more marbles than Maria. Ali had 9 marbles. How many marbles did Maria have? Maria had 4 fewer marbles than Ali. Ali had 9 marbles. How many marbles did Maria have? “Maria’s Marbles” by Illustrative Mathematics is licensed under CC BY 4.0. In part, the linguistic demands of compare problems make these problems more advanced than other subtypes of problems. Initially, students might have difficulty distinguishing the word “more” from the word “less.” Some students think the words are synonymous. Students should have lots of experience with the meaning of “less” so they can distinguish it from the meaning of “more.”15 ibid. p. 12. ibid. p. 12. ibid. p. 12. Typically, this happens in Kindergarten. (K.CC.C.6, K.MD.A.2) Also, the sentence structure of these compare problems can be confusing for students. For Bigger Unknown and Smaller Unknown problem types, students may not initially be able to distinguish the part of the sentence telling how many more/fewer. The task above states that Ali has 4 more marbles than Maria. Many students “hear” that Ali has more marbles, but they do not initially hear the part telling how many more. Students need practice hearing and saying a separate sentence for each part in order to understand and say the combined sentence form (e.g., Ali has more marbles than Maria. He has 4 more marbles). Other language issues center around the framing of the question in compare problems.16 ibid. p. 12. ibid. p. 12. ibid. p. 12. For example, asking, “How many marbles does Maria need to have as many as Ali?” in the task above is much more complex than asking, “How many marbles does Maria have?” Lastly, the two most challenging variations of compare problems have misleading language. For example, in the second problem in part b of the task above, a Bigger Unknown variation, the use of the word “fewer” suggests subtraction. However, the solution involves addition: Maria has 5 marbles, which is 4 fewer than Ali, so Ali has 5 + 4 = 9 marbles. Similarly, in the first problem in part c, a Smaller Unknown variation, the use of the word “more” suggests addition. However, the solution involves subtraction: Ali has 9 marbles, which is 4 more than Maria, so Maria has 9 – 4 = 5 marbles. The representation on the left shows that if you add the difference, which is 2, to Lucy she will then have the same amount as Julie, 5. The representation on the right shows that the difference of 2 is embedded within 5. The last cluster in the OA domain deals with understanding the meaning of the equal sign and determining the unknown in an equation. There are two standards associated with this cluster. Let’s begin our discussion of these standards after a close read. 1.OA.D.7 Understand the meaning of the equal sign, and determine if equations involving addition and subtraction are true or false. For example, which of the following equations are true and which are false? 6 = 6, 7 = 8 - 1, 5 + 2 = 2 + 5, 4 + 1 = 5 + 2. 1.OA.D.8 Determine the unknown whole number in an addition or subtraction equation relating three whole numbers. For example, determine the unknown number that makes the equation true in each of the equations 8 + ? = 11, 5 = _ - 3, 6 + 6 = _. These standards are integral to helping students engage with the 12 different subtypes (see the table above) of addition and subtraction problems. Understanding equations, and in particular, the meaning of the equal sign, will be vital to building a foundation for all later work in the OA domain. The standards call out the importance of understanding the meaning of the equal sign; so what does it mean? Too often, students come to understand the equal sign as meaning something like “the answer is.” For example, a student may read an equation like 3 + 2 = 5 as, “The answer when we add three plus two is five.” Unfortunately, this interpretation of the equal sign may lead to confusion in varied problem-solving contexts and in algebra. Instead, students should see the equal sign as a claim that the left-hand expression and the right-hand expression have the same value (the equal sign means “is the same number as”). In the following task, students evaluate whether quantities are equal and then write a true statement using the equal sign if appropriate. Though “number sentence” is used here and is a term easily accessible to students, “equation” is a perfectly acceptable word that students will use coherently throughout algebra. If they are not equal, write "not equal." “Equality Number Sentences” by Illustrative Mathematics is licensed under CC BY 4.0. In the following task, students find the missing number that makes addition and subtraction equations true. Note the different placement of the equal sign in each one, which again supports students in understanding its true meaning. “Find the Missing Number” by Illustrative Mathematics is licensed under CC BY 4.0. First-grade students use various tools to represent addition and subtraction problems. 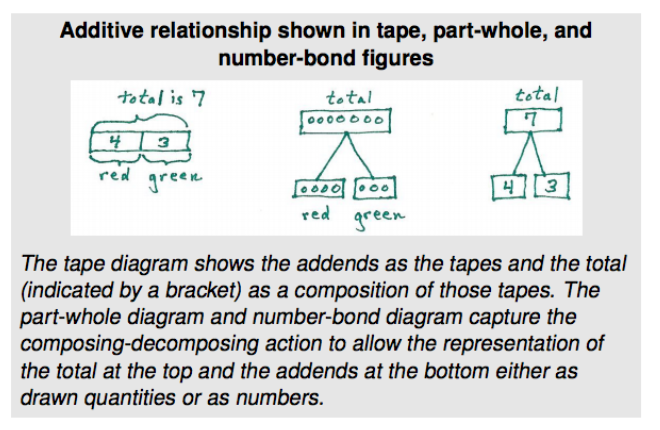 As described above, tape diagrams are a good tool for compare problems. Tape diagrams can also be used for Add To/Take From and Put Together/Take Apart problems they just look a little different. Number bonds are also good tools for additive relationships. 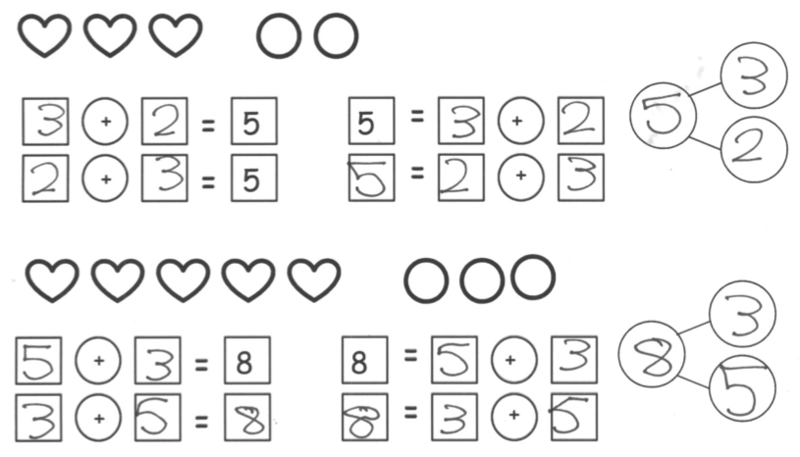 As students advance in their computational levels, they begin replacing pictures of quantities with numbers in their diagrams; for example, they move from drawing seven circles to writing the number 7. They also begin using solution equations (i.e., the equation used to solve the problem) more frequently than situation equations (i.e., the equation that represents the problem situation) and relate solution equations to diagrams.17 Progressions for the Common Core State Standards in Mathematics (draft): K, Counting and Cardinality; K–5, Operations and Algebraic Thinking, p. 17. Progressions for the Common Core State Standards in Mathematics (draft): K, Counting and Cardinality; K–5, Operations and Algebraic Thinking, p. 17. Progressions for the Common Core State Standards in Mathematics (draft): K, Counting and Cardinality; K–5, Operations and Algebraic Thinking, p. 17. There are lots of connections among standards in Grade 1; if you think about the standards long enough, you’ll probably start to see these relationships everywhere. In this section, we’ll talk about the connection between the Operations & Algebraic Thinking standards and the standard in the third cluster of the Measurement & Data (MD) domain. The standard in this MD cluster is a supporting standard and can be used to support work with the OA standards. Though part of this standard addresses organizing and representing data, the focus of the standard is on interpreting data for the purposes of solving addition and subtraction problems. In particular, data contexts lend themselves well to compare problems (how many “more” or” less” are in one category than in another). In the following example, students organize, represent and interpret data, and answer addition and subtraction questions, with respect to data. Use squares with no gaps or overlaps to organize the data from the pictures. Line up your squares carefully. Write a number sentence to show how many total students were asked about their favorite animal at the zoo. Write a number sentence to show how many fewer students like elephants than like giraffes. Grade 1, Module 3, Lesson 12 Available from engageny.org/resource/grade-1-mathematics-module-3-topic-d-lesson-12-0; accessed 2015-05-29. Copyright © 2015 Great Minds. UnboundEd is not affiliated with the copyright holder of this work. Another meaningful across-grade connection is to the first cluster of MD domain: Measure lengths indirectly and by iterating length units. (1.MD.A) This is a major cluster in which students begin to formalize their understanding about measuring and the dimension of length. Experience with measuring and length deepens understanding of the addition and subtraction operations; it also provides access to measuring contexts for the different types of word problems.18For more information about the connection between these operations and measurement, see part III (p. 6) of “The Three Pillars of First Grade Mathematics” by Roger Howe.For more information about the connection between these operations and measurement, see part III (p. 6) of “The Three Pillars of First Grade Mathematics” by Roger Howe.For more information about the connection between these operations and measurement, see part III (p. 6) of “The Three Pillars of First Grade Mathematics” by Roger Howe. In the example below, students engage with Add To subtypes using inches. The class had a pet snake. It was 14 inches long. It grew 3 more inches. How long is it now? The class had a pet snake. It was 14 inches long. It grew a few more inches. Now it is 17 inches long. How many inches did it grow? The class had a pet snake. It grew 3 more inches. Now it is 17 inches long. How long was it to start? “The Pet Snake” by Illustrative Mathematics is licensed under CC BY 4.0. Grade 1, Module 6, Lesson 13 Available from engageny.org/resource/grade-1-mathematics-module-6-topic-c-lesson-13; accessed 2015-05-29. Copyright © 2015 Great Minds. UnboundEd is not affiliated with the copyright holder of this work. On the left, the student decomposes 13 into 10 and 3, then uses place value understanding to quickly add 59 and 10. To complete the problem, she converts 69 + 3 to the simpler 70 + 2 via decomposition. 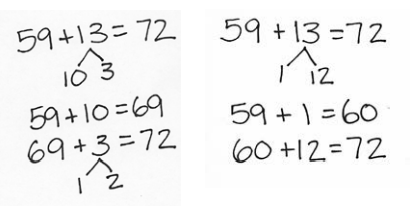 On the right, the student decomposes 13 into 1 and 12, to turn 59 + 13 into the simpler 60 + 12. Place value understanding allows for 60 + 12 to be added easily. Using Level 3 strategies as students progress through addition and subtraction has the dual benefit of supporting new understandings and reinforcing these strategies. As you’ve no doubt surmised, the big story in K-2 is about addition and subtraction. Standards from both the OA and the Counting & Cardinality (CC) domains are significant in defining these skills and understandings. Let’s take a closer look at this progression, specifically considering the strategies students learn, the fluencies they develop and problems they solve in each grade. This will allow us to think about how to explicitly connect new learning to previous understanding (and toward future learning), and about how to support students who may lack some prerequisite understandings. As we’ve discussed, the Progressions describe three levels of problem representation and solution. Let’s see how the standards show a progression of these strategies across these three grades. ➔ In Kindergarten, students connect counting to cardinality (i.e., the number of objects in a group)19 For students coming to first grade without the prerequisite understandings of the count sequence and of cardinality, please see our Content Guide on Counting & Cardinality in Kindergarten. For students coming to first grade without the prerequisite understandings of the count sequence and of cardinality, please see our Content Guide on Counting & Cardinality in Kindergarten. For students coming to first grade without the prerequisite understandings of the count sequence and of cardinality, please see our Content Guide on Counting & Cardinality in Kindergarten. and count to answer “How many?” questions. (K.CC.B.5) In keeping with the emphasis on counting, students use the Level 1 strategy of “counting all” to add and subtract, often using drawings or physical objects. 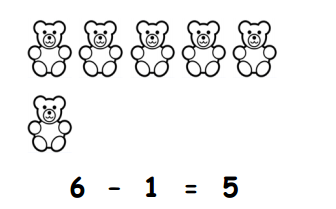 (K.OA.A.2) In this example, students are directed to cross out bears to represent the problem. Students would “count all” of the remaining bears to determine that there are 5. T: While we were cleaning up, some of the beans fell on the carpet. I picked most of them up, but I think I am still missing some. We had 7 beans in total, right? T: How many am I missing? Talk with your partner to solve this. T: Let’s try to count on to check how many I’m missing. T: So, how many beans am I missing? ➔ In Grade 1, students learn to “count on” to solve addition and subtraction problems, in addition to Level 3 strategies. (1.OA.C.6) In this lesson plan, the teacher works with students to count on to subtract 7 - 5; doing this also requires understanding subtraction as an unknown-addend problem (1.OA.B.4) (solving 7 - 5 = ? is the same as solving 5 + ? = 7). T: Let’s draw to solve 9 + 4 using circles and Xs. T: How many Xs will we add? T: Did we make a ten? T: Our 9 + 4 is now a ten-plus fact. What fact can you see in the drawing? S: 10 + 3 = 13. T: 10 + 3 equals? T: So, 9 + 4 equals? ➔ Students work to develop fluency with addition and subtraction within 20 in Grade 2. Students mentally apply the strategies developed in Grade 1 and know single-digit addition and subtraction facts from memory. (2.OA.B.2) Incorporating strategies based on place value (2.NBT.B.5) allows students to add and subtract larger numbers. From a conceptual bases of counting and strategies, students develop fluency with addition and subtraction across these three grades. The expected fluency in Kindergarten is to add and subtract within 5. (K.OA.A.5) In Grade 1, the fluency expectation for adding and subtracting is within 10, (1.OA.C.6) and in Grade 2, the fluency expectation is adding single-digit numbers within 20 (and the associated subtractions). (2.OA.B.2) As with all fluencies, the expectation is that students are fluent by the end of the year. Also, fluency results from extensive work making meaning of addition and subtraction as opposed to rote memorization. The following are examples of fluency practice exercises from these grades. ➔ Students work to develop fluency with addition and subtraction within 5 in Kindergarten. (K.OA.A.5) Note the varied placement of the missing sums, which supports flexible thinking about the equal sign. In addition to learning strategies and developing fluency with addition and subtraction, students also solve a variety of problems across these three grades. 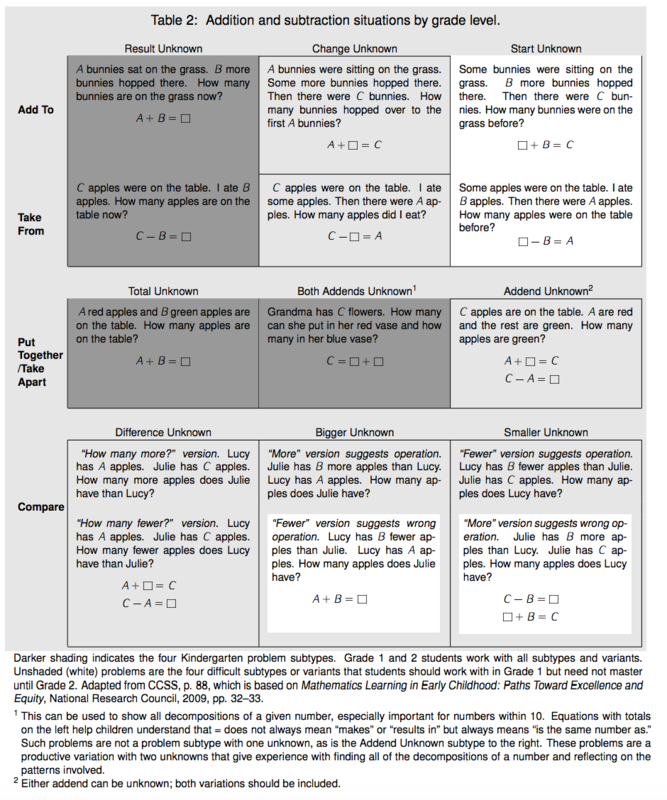 The adapted table from the Standards, as shown in Part 1 of this guide, outlines the progression of addition and subtraction word problems across Grades K-2. Let’s take a closer look at these. Julia went to the beach and found 3 seashells. Her sister Megan found 2 seashells. Draw the seashells the girls found. How many did they find in all? Talk to your partner about how you know. ➔ In Kindergarten, students solve “add to” and “take from” problems with result unknown and “put together/take apart” problems with total unknown and both addends unknown within 10. This is a “put together” problem (Julia’s shells and Megan’s shells are put together) with the total unknown (we want to know how many there are in all). Toby collects shells. On Monday, he finds 6 shells. On Tuesday, he finds some more. Toby finds a total of 9 shells. How many shells does Toby find on Tuesday? ➔ In Grade 1, students are exposed to all 12 subtypes. They master solving “add to” and “take from” problems, this time with the change unknown, and “put together/take apart” problems with an unknown addend. They are also exposed to a variety of compare problems; full mastery of all compare subtypes is not expected until Grade 2. This is an “add to” problem (shells are added to Toby’s initial six shells) with the change unknown (we need to figure out how many more are required to get to a total of 9 shells). Mei’s frog leaped several centimeters. Then, it leaped 34 centimeters. In all, it leaped 50 centimeters. How far did Mei’s frog leap at first? Draw a picture and write a number sentence to explain your thinking. ➔ In Grade 2, students master all subtypes, with an emphasis on work with the most challenging types: “add to” and “take from” problems again, this time with the start unknown; and certain more challenging compare problems. Students also solve two-step problems. This is an “add to with start unknown” problem (34 centimeters are added to several unknown centimeters to get 50 centimeters). Students need to figure out the number of centimeters the frog leaped initially. If, going into a unit on addition and subtraction, you know your students don’t have a solid grasp of the ideas developed in Kindergarten, what can you do? We know it’s not practical (or even desirable) to reteach everything students should have learned in Kindergarten; there’s plenty of new material in Grade 1, so the focus needs to be on grade-level standards. At the same time, there are strategic ways of wrapping up “unfinished learning” from prior grades and honing essential fluencies within a unit on Grade 1 addition and subtraction. Here are a few ideas for adapting your instruction to bridge the gaps. Developing a solid understanding of addition and subtraction in K-2 is important for developing understanding of multiplication and division. Students draw on their understanding of properties of addition, the relationship between addition and subtraction, and decomposition of numbers to build meaning for multiplication and division. Also, strong facility with addition and subtraction and related word problems helps students to better distinguish multiplication and division from addition and subtraction. In the Grade 4 example below, students solve a two-step word problem involving addition and multiplication of whole numbers. By this point, students use the standard algorithm for multi-digit addition and subtraction and properties of operations (e.g., the distributive property, which is based on decomposing numbers) and area models to multiply. A restaurant sells 1,725 pounds of spaghetti and 925 pounds of linguini every month. After 9 months, how many pounds of pasta does the restaurant sell? Grade 4, Module 3, Lesson 11 from EngageNY.org of the New York State Education Department is licensed under CC BY-NC-SA 3.0. Students need a firm understanding of which operations to apply and how to perform them. This comes from having many experiences developing meaning for the operations and using strategies rooted in conceptual understanding, a big part of which happens in Grade 1. Though the standards in the OA domain concentrate on experience with whole numbers, the concepts, properties, methods, and representations extend beyond to other number systems and even algebraic expressions. All of these pieces, when combined with place value reasoning, allow students to extend computation to multi-digit numbers (the NBT progression), to fractions (the NF progression), to measurement, and to algebra (e.g., expressions and equations—EE). Congratulations on making it through this Grade 1 guide for Operations & Algebraic Thinking with Connections to Data. We hope it provided a clear and detailed explanation of what these standards say, and how Operations & Algebraic Thinking relate to other mathematical concepts in Grade 1, as well as Kindergarten and Grade 2. The Common Core State Standards for Mathematics (CCSSM) are organized into major, additional, and supporting clusters in the Focus by Grade Level documents from Student Achievement Partners. The K-8 Publishers’ Criteria for the Common Core Standards for Mathematics recommends spending 65-85% of instructional time on the major work of the grade. In this guide, these clusters are indicated by a <greensquare>. Progressions for the Common Core State Standards in Mathematics (draft): K, Counting and Cardinality; K–5, Operations and Algebraic Thinking, p. 36. The addition and subtraction word problems that elementary students should master are described in Table 1 of the glossary of the CCSSM. There is a hierarchy of complexity with these problems that is described on page 9 in the Progressions. All of this is explained in great detail on the discussion of cluster 1.OA.A below. Progressions for the Common Core State Standards in Mathematics (draft): K, Counting and Cardinality; K–5, Operations and Algebraic Thinking, p. 9. Progressions for the Common Core State Standards in Mathematics (draft): K, Counting and Cardinality; K–5, Operations and Algebraic Thinking, p. 17. For more information about the connection between these operations and measurement, see part III (p. 6) of “The Three Pillars of First Grade Mathematics” by Roger Howe. For students coming to first grade without the prerequisite understandings of the count sequence and of cardinality, please see our Content Guide on Counting & Cardinality in Kindergarten. In our work with high academic standards, we often hear educators ask, “What does standards-aligned instruction look like?” Our Content Guides aim to answer this question by providing an in-depth look at one or a few clusters of math standards at a time. The Content Guides are grade-level and content area-specific, and there are guides for each grade or course, from Kindergarten to Algebra II. If you want to learn more about teaching Ratios and Proportional Relationships in Grade 6, for example,our associated Content Guide will give you a comprehensive but accessible explanation about these standards, multiple Open Educational Resource (OER) examples that are aligned to the standards, and concrete suggestions to support the teaching of Grade 6 ratios and proportional reasoning. Our goal in creating the Content Guides has been to provide busy teachers with a practical and easy-to-read resource on what the grade-level math standards are saying, along with examples of instructional materials that support conceptual understanding, problem-solving, and procedural skill and fluency for students. It’s important to note that content guides are not meant to serve as a curriculum (or any kind of student-facing document), a guide or source material for test-preparation activities, or any kind of teacher evaluation tool. Part 1 makes clear the student skills and understandings described by this group of standards. This section illustrates the standards using multiple student tasks from freely available online sources. Teachers can use or adapt these tasks for their students. Part 2 explains how this group of standards is connected to other standards in the same grade. We highlight how these connections have implications for planning and teaching, and how this within-grade coherence can increase access for students. Part 2 also includes multiple student tasks from freely available online sources. Part 3 traces selected progressions of learning leading to grade-level content discussed in the specific Content Guide. This discussion segues into a series of concrete and practical suggestions for how teachers can leverage the progressions to teach students who may not be prepared for grade-level mathematics. Finally, Part 3 traces the progression to content in higher grades. Teachers who have read our Content Guides say they see benefits for all educators. Here are some suggestions for how different educators might use them. Increase or refresh their knowledge of the standards and the expectations for what students should know by the end of the year. Adapt lessons and units using appropriate pre-requisites to support students who are behind grade-level. Focus on the major work of the grade and the appropriate depth of each standard. Target the appropriate aspects of rigor—procedural skill and fluency, modeling and application, and conceptual understanding described by the standards. Help students make coherent connections within and across grades. Create or revise their lessons and questioning to focus on important concepts in the standards. Refresh or increase their knowledge of the standards and the expectations for what students should know by the end of the year. Develop and communicate consistent expectations for lesson planning and instruction aligned to the standards. Provide a reference when planning and/or discussing instruction with teachers. Gain insight into what instruction and student work should look like in order to meet the demands of the standards. Develop and design content and standards-driven professional development sessions/workshops. Foster content rich, standards-based discussions among staff and build staff knowledge. Develop and/or revise school improvement plans in order to support and incorporate content and practice-based teaching and learning. The transition to higher standards has led teachers all over the country to make significant changes in their planning and instruction, but only one-third of teachers feel they are prepared to help their students pass the more rigorous standards-aligned assessments (Kane et.al., 2016). This is to be expected because the new high standards are a significant departure from prior standards. The standards require a deeper level of understanding of the math content they teach; a different progression of what students need to learn by which grade; as well as different pedagogy that emphasizes student conceptual understanding, problem solving and procedural fluency in equal intensity. The support for teachers to bring high standards to their classrooms, however, has lagged behind. Research shows that teacher training in the U.S. is currently insufficient in preparing teachers to teach the demanding new standards (Center for Research in Mathematics and Science Education, 2010). And though some resources exist that “unpack” the standards, few, if any, explain and illustrate the standards. “Unpacking” the standards one by one can also result in a disjointed presentation that neglects the structure and coherence of the standards. In creating the Content Guides, we aimed to provide busy teachers with a practical, easy-to-read resource on their grade-specific standards and how to help all students learn them. There is ample empirical evidence that when teachers have both strong knowledge of the math content that they teach, and the pedagogical knowledge to help students master that content knowledge, their students learn more (Baumert et. al., 2010; Hill, Rowan and Ball, 2005; Rockoff et. al., 2008). With the Content Guides in hand, we hope that teachers will find more success in helping their students make progress toward college- and career-readiness. The Progressions documents describe the grade-to-grade development of understanding of mathematics. These were informed by research on children’s cognitive development as well as the logical structure of mathematics. The Progressions explain why standards are sequenced the way they are. The Content Guides often highlight key ideas from the Progressions, but do not add new standards or change the expectations of what students should know and be able to do; they aim to explain and illustrate a group of standards at a time using freely available online sources. While the OER tasks and lessons in the Content Guides are one way to meet the grade-level standards, they are not the only means for doing so. We selected sample tasks and lessons from freely available online sources such as EngageNY, Illustrative Mathematics and Student Achievement Partners to illustrate the Standards. These sources are chosen because they are fully aligned to the new high standards based on national review of K-12 curricula or are created by organizations led by the writers of the new high standards. In addition, because they are open educational resources (OER), they are freely accessible for all uses. All UnboundEd materials are also OER, as part of our commitment to make high-quality, highly aligned content available to all educators. Each Content Guide addresses a subset of the standards for the grade. The standards addressed in the first set of Content Guides for each grade usually address high-priority content; these standards are also often a good choice for teaching at the beginning of the year. More information about the selection of standards can be found in the introduction to each Content Guide. Over time, we will develop additional Content Guides for each grade and update existing ones. We plan to have four Content Guides for each grade or course, from Kindergarten to Algebra II. The guides will be published in waves, with each wave consisting of one guide for each grade. We plan to release a second set of Content Guides for each grade by the end of the 2016-17 school year. If you would like to receive updates on content and events from UnboundEd, including new Content Guides, please sign up for UnboundEd announcements here. Represent and solve problems involving addition and subtraction. Understand and apply properties of operations and the relationship between addition and subtraction. Add and subtract within 20. Work with addition and subtraction equations. Represent and interpret data. Represent and interpret data. Add and subtract within 20. Understand and apply properties of operations and the relationship between addition and subtraction. Represent and solve problems involving addition and subtraction. Work with addition and subtraction equations. Make sense of problems and persevere in solving them. Add and subtract within 20. Add and subtract within 20. Relate counting to addition and subtraction (e.g., by counting on 2 to add 2). Add and subtract within 20, demonstrating fluency for addition and subtraction within 10. Use strategies such as counting on; making ten (e.g., 8 + 6 = 8 + 2 + 4 = 10 + 4 = 14); decomposing a number leading to a ten (e.g., 13 - 4 = 13 - 3 - 1 = 10 - 1 = 9); using the relationship between addition and subtraction (e.g., knowing that 8 + 4 = 12, one knows 12 - 8 = 4); and creating equivalent but easier or known sums (e.g., adding 6 + 7 by creating the known equivalent 6 + 6 + 1 = 12 + 1 = 13). Solve addition and subtraction word problems, and add and subtract within 10, e.g., by using objects or drawings to represent the problem. Relate counting to addition and subtraction (e.g., by counting on 2 to add 2). Count forward beginning from a given number within the known sequence (instead of having to begin at 1). Apply properties of operations as strategies to add and subtract. Understand and apply properties of operations and the relationship between addition and subtraction. For any number from 1 to 9, find the number that makes 10 when added to the given number, e.g., by using objects or drawings, and record the answer with a drawing or equation. Decompose numbers less than or equal to 10 into pairs in more than one way, e.g., by using objects or drawings, and record each decomposition by a drawing or equation (e.g., 5 = 2 + 3 and 5 = 4 + 1). Compose and decompose numbers from 11 to 19 into ten ones and some further ones, e.g., by using objects or drawings, and record each composition or decomposition by a drawing or equation (e.g., 18 = 10 + 8); understand that these numbers are composed of ten ones and one, two, three, four, five, six, seven, eight, or nine ones. Fluently add and subtract within 20 using mental strategies. By end of Grade 2, know from memory all sums of two one-digit numbers. 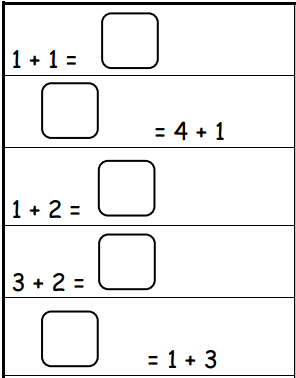 Add within 100, including adding a two-digit number and a one-digit number, and adding a two-digit number and a multiple of 10, using concrete models or drawings and strategies based on place value, properties of operations, and/or the relationship between addition and subtraction; relate the strategy to a written method and explain the reasoning used. Understand that in adding two-digit numbers, one adds tens and tens, ones and ones; and sometimes it is necessary to compose a ten. Understand and apply properties of operations and the relationship between addition and subtraction. Understand and apply properties of operations and the relationship between addition and subtraction. Apply properties of operations as strategies to add and subtract. Understand subtraction as an unknown-addend problem. Apply properties of operations as strategies to add and subtract. Understand subtraction as an unknown-addend problem. Represent and solve problems involving addition and subtraction. Represent and solve problems involving addition and subtraction. 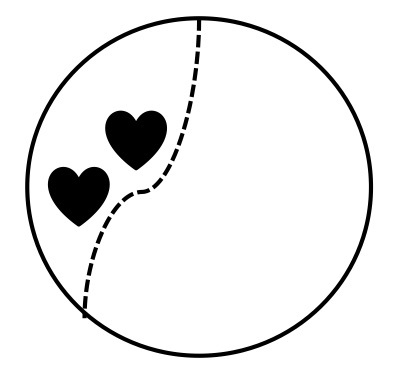 Use addition and subtraction within 20 to solve word problems involving situations of adding to, taking from, putting together, taking apart, and comparing, with unknowns in all positions, e.g., by using objects, drawings, and equations with a symbol for the unknown number to represent the problem. Solve word problems that call for addition of three whole numbers whose sum is less than or equal to 20, e.g., by using objects, drawings, and equations with a symbol for the unknown number to represent the problem. Use addition and subtraction within 20 to solve word problems involving situations of adding to, taking from, putting together, taking apart, and comparing, with unknowns in all positions, e.g., by using objects, drawings, and equations with a symbol for the unknown number to represent the problem. Identify whether the number of objects in one group is greater than, less than, or equal to the number of objects in another group, e.g., by using matching and counting strategies. Compare two numbers between 1 and 10 presented as written numerals. Compare two numbers between 1 and 10 presented as written numerals. Use addition and subtraction within 20 to solve word problems involving situations of adding to, taking from, putting together, taking apart, and comparing, with unknowns in all positions, e.g., by using objects, drawings, and equations with a symbol for the unknown number to represent the problem. Identify whether the number of objects in one group is greater than, less than, or equal to the number of objects in another group, e.g., by using matching and counting strategies. Directly compare two objects with a measurable attribute in common, to see which object has "more of"/"less of" the attribute, and describe the difference. Work with addition and subtraction equations. Determine the unknown whole number in an addition or subtraction equation relating three whole numbers. Determine the unknown whole number in an addition or subtraction equation relating three whole numbers. Represent and interpret data. Organize, represent, and interpret data with up to three categories; ask and answer questions about the total number of data points, how many in each category, and how many more or less are in one category than in another. Measure lengths indirectly and by iterating length units. Add and subtract within 20, demonstrating fluency for addition and subtraction within 10. Use strategies such as counting on; making ten (e.g., 8 + 6 = 8 + 2 + 4 = 10 + 4 = 14); decomposing a number leading to a ten (e.g., 13 - 4 = 13 - 3 - 1 = 10 - 1 = 9); using the relationship between addition and subtraction (e.g., knowing that 8 + 4 = 12, one knows 12 - 8 = 4); and creating equivalent but easier or known sums (e.g., adding 6 + 7 by creating the known equivalent 6 + 6 + 1 = 12 + 1 = 13). Use place value understanding and properties of operations to add and subtract. Count to answer "how many?" questions about as many as 20 things arranged in a line, a rectangular array, or a circle, or as many as 10 things in a scattered configuration; given a number from 1—20, count out that many objects. Solve addition and subtraction word problems, and add and subtract within 10, e.g., by using objects or drawings to represent the problem. Add and subtract within 20, demonstrating fluency for addition and subtraction within 10. Use strategies such as counting on; making ten (e.g., 8 + 6 = 8 + 2 + 4 = 10 + 4 = 14); decomposing a number leading to a ten (e.g., 13 - 4 = 13 - 3 - 1 = 10 - 1 = 9); using the relationship between addition and subtraction (e.g., knowing that 8 + 4 = 12, one knows 12 - 8 = 4); and creating equivalent but easier or known sums (e.g., adding 6 + 7 by creating the known equivalent 6 + 6 + 1 = 12 + 1 = 13). Understand subtraction as an unknown-addend problem. Fluently add and subtract within 20 using mental strategies. By end of Grade 2, know from memory all sums of two one-digit numbers. Fluently add and subtract within 100 using strategies based on place value, properties of operations, and/or the relationship between addition and subtraction. Fluently add and subtract within 5. Add and subtract within 20, demonstrating fluency for addition and subtraction within 10. Use strategies such as counting on; making ten (e.g., 8 + 6 = 8 + 2 + 4 = 10 + 4 = 14); decomposing a number leading to a ten (e.g., 13 - 4 = 13 - 3 - 1 = 10 - 1 = 9); using the relationship between addition and subtraction (e.g., knowing that 8 + 4 = 12, one knows 12 - 8 = 4); and creating equivalent but easier or known sums (e.g., adding 6 + 7 by creating the known equivalent 6 + 6 + 1 = 12 + 1 = 13). Fluently add and subtract within 20 using mental strategies. By end of Grade 2, know from memory all sums of two one-digit numbers. Fluently add and subtract within 5. Apply properties of operations as strategies to add and subtract. Understand subtraction as an unknown-addend problem. Add and subtract within 20, demonstrating fluency for addition and subtraction within 10. Use strategies such as counting on; making ten (e.g., 8 + 6 = 8 + 2 + 4 = 10 + 4 = 14); decomposing a number leading to a ten (e.g., 13 - 4 = 13 - 3 - 1 = 10 - 1 = 9); using the relationship between addition and subtraction (e.g., knowing that 8 + 4 = 12, one knows 12 - 8 = 4); and creating equivalent but easier or known sums (e.g., adding 6 + 7 by creating the known equivalent 6 + 6 + 1 = 12 + 1 = 13). Determine whether a group of objects (up to 20) has an odd or even number of members, e.g., by pairing objects or counting them by 2s; write an equation to express an even number as a sum of two equal addends. Represent and solve problems involving addition and subtraction.